A set of 10 journal cards coordinating with Just Right Papers and Sprinkles V28! The individual card files are great for digital layouts and digital project life spreads. These cards are also formatted on high resolution pdf files, making it easy to print out and use on hybrid projects or project life album. An artsy collection of 10 journal cards (2 6x4 inches, 8 3x4 inches) created by Nicole Russell using my Joodle Strips 4! Add a touch of artsy fun to your pocket pages with these colourful cards, or use them as journal spots on your layouts! Co-ordinates with the rest of the October 2014 BYOC collection. Supplied as individual jpeg files and as a letter sized ready-to-print PDF file. 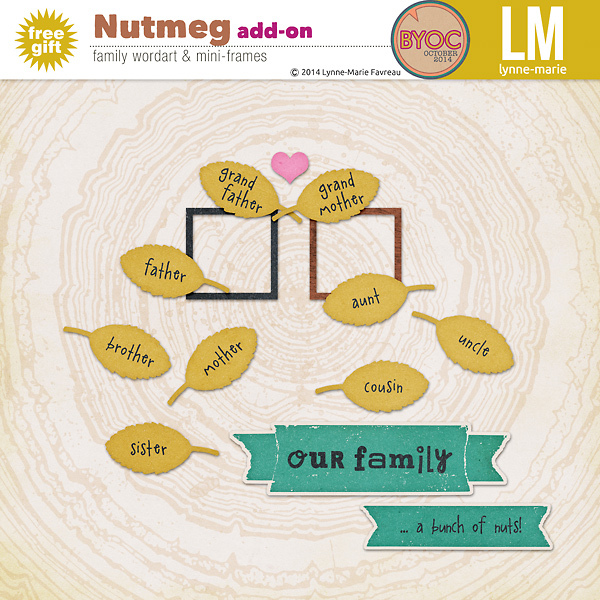 Get the Nutmeg bundle at a discount! Includes the Nutmeg papers, elements and journal cards. Part of the October 2014 BYOC. Don't miss the Nutmeg FREE add-on. A set of 14 buttons that coordinate with the 2014 October BYOC. A set of 12 pattern papers, each with unique distressing and texture. Coordinates with the 2014 October BYOC. a fun transparent vellum alpha that coordinates with the october '14 byoc. includes a-z, 0-9, !, #, &, and a heart. each alpha is a separate .png file. 4 templates inspired by pretty paper pieces. templates include custom shadowing based on element and paper placement. downloads are available as .PSD, .PSD friendly with Paint Shop Pro, .JPG, or .TIF, .PNG.